The Maharaja had his early education and training at the Lokaranjan Palace under the direction of P. Raghavendra Rao. In addition to Western studies, Krishna was instructed in the languages of Kannada and Sanskrit, in horse riding, and in Indian and western Classical music. His early administrative training was imparted by Sir Stuart Fraser of the Bombay Civil Service. The study of the principles of jurisprudence and methods of revenue administration were supplemented by extensive tours of the state during which he gained extensive knowledge of the nature of the country which he was later to govern. 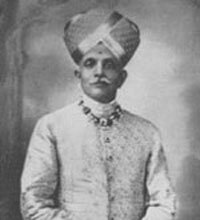 Krishna Raja Wadiyar was the first Chancellor of Banaras Hindu University and University of Mysore. The latter was the first university chartered by an Indian State. The Indian Institute of Science at Bangalore which was initiated during His mother’s tenure as Regent was started during his reign, with the gift, in 1911, of 371 acres (1.5 km²) of land and a donation of funds. He was a patron of Indian (both Carnatic and Hindustani) and Western Classical Music.